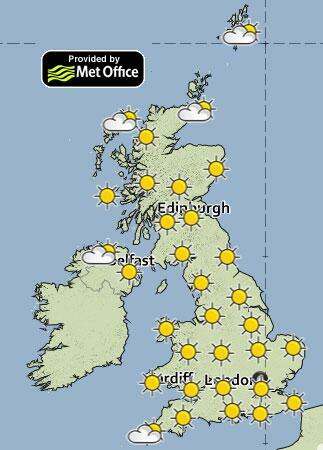 Met Office (@metoffice) tweet from Fri 5th July. So with the glorious weather forecast, I guess many of you will be heading for the beach or countryside to bask in the glorious burning radiation of a star that's 93 million miles away (I always find that amazing that something so far away can actually burn you). Please be careful folks, as they say in Australia, "slip, slap, slop" don't be frugal when it comes to sun block. As many of you will know, I broke my personal best on the moth trap last week with 295 moths and judging by the weather today, I'm thinking that record might be broken again tonight when I get the trap out once again. The weather here in Costa Del Ipswich has been lovely and ideal for the insect life. As I tap this blog out now, I'm sitting in my garden, surrounded by buzzing bees, fluttering damselflies and hovering hoverflies, it's beautiful. I'm also hoping to conduct my yearly National Bat Monitoring Program survey tomorrow night as again, the weather is looking ideal for it. I will also be helped by a friend and bat carer Jackie who's new to this batting lark and wants to know more. So if you happen to peer out of your window in the middle of the night and see two people standing on the corner of your street with a clipboard and a handheld box of electrics, don't panic, it's just a couple of batty people! Which leads me on nicely to this. There's a new citizen science project that everyone with a smartphone and 10 secs a day (or even a week) to spare can do. It's FREE and is sponsored by Waitrose and it's called 'Bee Friendly' and aims to collect and research data on what plants pollinators like, bees, butterflies and other insects, like to visit. You don't even have to know what species of insect or plant that you're looking at, you don't have to be a wildlife enthusiast at all. Just take a pic with your phone and a Joanna Lumley would say, "clicky clicky, slide slide" and Bob's your uncle, Nelly's your aunt you've submitted some useful data. It's that easy, and if you don't like or struggle with the app, then delete it, it cost you nothing. Also something to have fun and participate in is the Big Butterfly Count. It's on between 20th July - 11th August and all you have to do is find a nice spot, whether it's in your garden or your local park or nature reserve, and count what butterflies and moths (some moths fly in the day too) you see in 15 minutes, it's not rocket science so you have no excuses, go there now and sign up! Some of you may have noticed that I've changed the decor to the blog again. I do this from time to time as I like to keep the blog looking fresh. However, if there's something you do or don't like about it, please let me know, I aim to please. As some of you may know, I was rewarded last week with some Elephant Hawkmoth D elpenor eggs, eight of them in fact. I read up to find out what food plants they require as many people don't realise that caterpillars won't just eat any old leaf that's put in front of them. No, some are extremely fussy and Elephant Hawkmoths are no exception. Apparently, the larvae only feed on Bedstraw, Rosebay Willowherb or Fuscia's. Firstly, Fuscia's are far too expensive for me to be buying, I've looked up Bedstraw and I have no idea where I'm going to find it. Apparently, it's a common weed that grows everywhere, but I'm no botanist and the majority of plants all look pretty much the same to me. However, that said I do have a vague idea of what a willowherb looks like as I have it growing in my garden. Unfortunately, it's not Rosebay Willow herb, but knowing what Willowherb looks like and a gander at my flower book showed me what to look for. Again, willowherb is a weed and grows almost everywhere you don't want it to grow, so I popped out to my local patch and the second group of plants I came across were willow herbs (the first bunch in case your wondering was Bracken). I took a pic and tweeted it with the question "Is this Rosebay Willowherb?" Within 5 mins three 'tweeps' tweeted back with a YES! Bonus! I pulled up a couple by the root and took them home to replant in a pot out in the garden. These would be the first food the new mini munchers would get after hatching. Unfortunately, after getting home I checked on the eggs and I'm getting the feeling that they might not hatch at all. On looking at them under the hand lens, I can see that each egg seems to have an indentation in them as if they are beginning to collapse. This could be a sign that they are in fact infertile and all my efforts were in vain. However, I'm hoping that my observations might be leading me to the wrong conclusions and I continue to monitor them on a daily basis. Watch this space! Well, not only are my mini munchers getting bigger, they're getting noisier too. So much so, Trousers the cat like to sit and watch them. Trousers watches intently at the strange, noisy green things. Yes, it may be hard to believe, but they really are noisy eaters as they chomp, chomp, chomp (and it is a CHOMP) through the constant supply of leaves I have to give them on a two day basis. Couple this with the constant pattering of frass falling onto the newspaper below and multiply that by 70 caterpillars and it just becomes a constant sound. It's not something you would want in your bedroom, let me tell you. Noise aside though, and they are making excellent progress from 5 weeks back when they were tiny little things on my finger tip. They are now huge and I'm expecting that they'll be getting ready to start building their cocoons soon. On my thumb and he's not the biggest one. Regardless of how many leaves I put in there, they all seem to want the same ones! I had intended on releasing them just before they got ready to overwinter, but after speaking with the County Moth Recorder, he advised me that it would be better for them if I let them build their cocoons some sticks in placed in their cage, then let them hang up outside the shed over the winter period. This way, they would stand a much better chance of survival than if I just put them out as caterpillars. So it looks like their with me for the long haul! As I write this, a dragonfly just whizzed past my head and straight over the fence. Couldn't be certain to what species it was, but it looked like a 'chaser'. More importantly, it's the first one I've seen in the garden this year, although Wifey revels in the fact that she saw one in the garden last weekend whilst I was inside. Anyway, after seeing this dragonfly I sat by the pond in the hope it would return and I could get a closer look at it, unfortunately, it didn't return. However, things happen for a reason I always say and whilst I was sitting there watching the damselflies chase each other about I heard a strange, muffled buzz. I looked to see the a bee had fallen off a leaf and landed on its back in the pond! Due to any injury I have at the moment, I wasn't able to reach out to it, but I did have my insect net nearby and I stretched the handle across for the bee to grab onto, which it did (clever thing). On closer inspection I noticed that it wasn't a bee, in fact, it was a bee mimic. A fly with bee markings. So whilst my little friend dries himself off, I'll say take care and take it easy, have a lovely weekend and don't get burnt!!! A record and a reward!